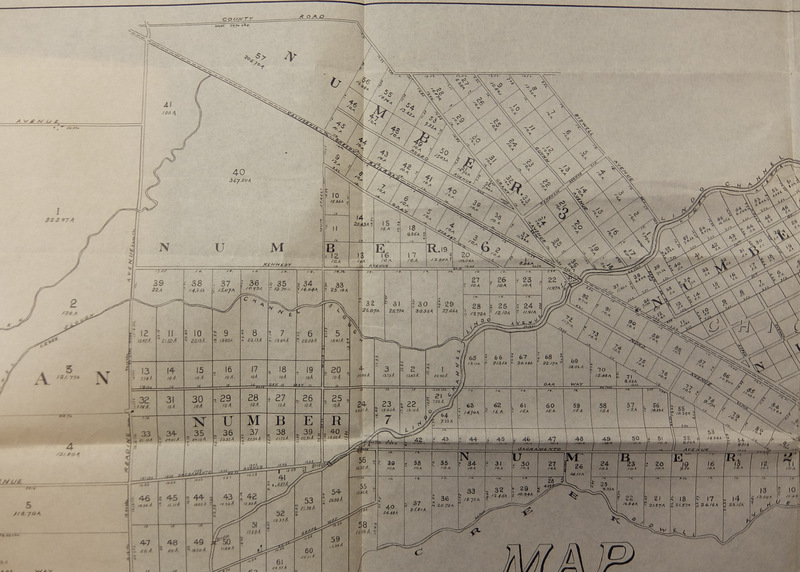 A section of the map of the subdivisions of John Bidwell’s Rancho. Take a look at the section labeled NUMBER 3. It’s at the top of the map. That’s where I live, on Bidwell Ave. The Bidwell Ave. on this old map runs from Lindo Channel to the County Road (now Bell Road). Today there is another Bidwell Avenue in town which runs along Big Chico Creek west of Nord Ave. (Highway 32.) At one time there must have been two Bidwell Avenues in Chico. I guess my street lost the coin toss, because it is not called Bidwell Avenue today. I wish it was. It is now Alamo Avenue, between Guynn Ave. on the west and Cussick on the east, although Cussick didn’t make it on to this map. There are some other interesting things to notice on this section. Grant Ave., to the west of Guynn, is now Nord Ave. The Grange is located where Grant and Rodeo intersect. But Nord Ave. is also Hwy. 32, which is confusing. Why they didn’t leave that section with the name Grant I have no idea. On this old map Nord Ave. ends at Lindo Channel, and the road on the other side is Gray Street. When Nord was extended, Gray turned into Nord. East Avenue didn’t even exist. I suspect that John Bidwell named Gray Street after his orchard manager, George Moses Gray, and Grant Avenue after General Ulysses S. Grant, whom he greatly admired. He probably wouldn’t have cared for the name changes. I have always wondered if the big old black walnut trees along Alamo Ave. were planted by General Bidwell. I like to think they were, and the fact that this road existed in his day, and was named after him, makes me think they must have been. This entry was posted in Maps, Uncategorized. Bookmark the permalink. 2 Responses to Where Is/Was Bidwell Avenue? I have found this map really interesting and so appreciate your information about it. Certainly makes me want to take another trip slowly down that part of town. The map at the Patrick Ranch Museum that looks similar to this map was done by H.B. Shackelford so not the same at all. H.B. Shackelford is the surveyor on this map, so maybe they are the same, or close. Cussick was the agent who was selling the lots for Bidwell.